A rainstorm has destroyed over 46 houses and rendered many families homeless in Are Ekiti in the Irepodun /Ifelodun Local Government Area of Ekiti State . The rainstorm did not spare the palace of the Alare of Are Ekiti, Oba Boluade Adebiyi , which had part of its roof blown away on Tuesday . 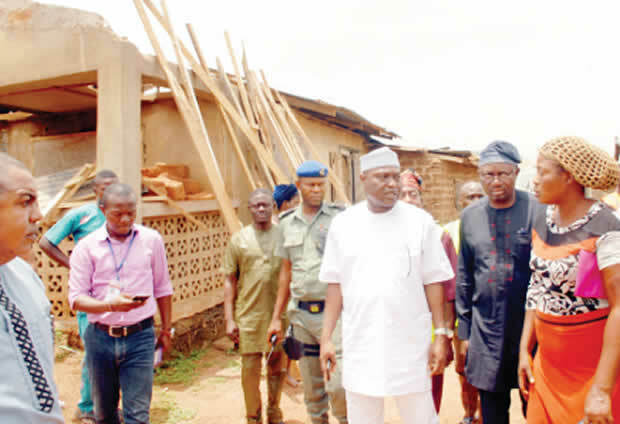 The traditional ruler, who explained that the victims had yet to get relief materials, expressed hope that both the Ekiti State Emergency Management Agency and the National Emergency Management Agency , which had jointly visited the community , would do something very soon . One of the victims, Mr Ayodele Anisulowo of Odo Ode Street , lamented that the roof of his family house was blown away by the rainstorm , and his household had been rendered homeless , while many properties were destroyed by storm . An octogenarian widow and victim of the rainstorm , Madam Jibiye Adeleye, was forced to relocate to her father ’ s house, where she said she left about 60 years ago when she got married. The General Manager, SEMA , Mr Buruji Olajide , said apart from Are Ekiti, other communities, including Ado Ekiti , Afao, Igbemo , Isan Ekiti and Iludun , were also affected by the rainstorm . Olajide stated , “ The SEMA and NEMA have jointly visited some of the affected areas for an on- the -spot assessment of the damage . Among properties destroyed in Afao was the newly -completed Gifted Academic . We have been able to establish that more than 70 houses were affected . Meanwhile, the state government has promised to assist residents whose properties were destroyed by the rainstorm. The Secretary to the State Government , Biodun Oyebanji, and the Chief of Staff to the Governor, Biodun Omoleye , said the state government would work with NEMA to alleviate the suffering of the vicitms. The SSG said the Governor Kayode Fayemi administration would always be swift in responding to the plight of the people . He urged the residents to cultivate the habit of planting trees, which could help in protecting the environment ; noting that the trees within the Ado Community High School premises prevented the rainstorm from wreaking havoc in the school .